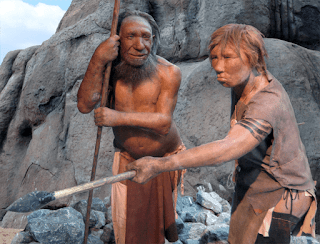 A couple of human paleo stories. I've been sitting on this one a while, trying to find a hook; Neandertals weren't the stooped over shambling ogres that they're usually portrayed as: We Have Been Wrong About a Key Feature of Neanderthals' Appearance. After more than a century of alternative views, a new study has reconfirmed that Neanderthals once walked fully upright with a posture not unlike our own. They weren't hunched after all. I don't really think there's any evidence they were particularly hairy compared to modern humans either. I think that's just an assumption based on the false presumption that being an earlier form of human, they were more beast like. My guess is that different populations of Neandertals (they lived a long time in a lot of different places) had different amounts of hair depending on how and where they lived. The reanalysis is based on an elderly male Neanderthal that was found in La Chapelle-aux-Saints, France in 1911. Creating a virtual reconstruction of the ancient skeleton's pelvis and spine, the authors say that both the stress on the hip and the position of the pelvis are not so different from modern humans. "On the whole, there is hardly any evidence that would point to Neanderthals having a fundamentally different anatomy," explains Martin Haeusler, a specialist in evolutionary medicine at the University of Zurich. Well, they looked good enough to mate with "anatomically modern humans" and leave their traces in our genes; but not that that's a high bar. A chunk of a Denisovan skull has been identified for the first time - a dramatic contribution to the handful of known samples from one of the most obscure branches of the hominin family tree. Paleoanthropologist Bence Viola from the University of Toronto will discuss the as-yet-unpublished discovery at the upcoming meeting of the American Association of Physical Anthropologists in Cleveland, Ohio, at the end of March. Very little is known about the Denisovans, an extinct branch of hominins that was a sister group to Neanderthals. Only four individual Denisovans had been identified previously, all from one cave in Siberia. The first Denisovan was described in 2010 from the fragment of a pinky finger bone, and three more were identified from teeth. This skull piece, excavated about three years ago in that same Siberian cave, represents a fifth individual. "It's very nice that we finally have fragments like this," says Viola. "It's not a full skull, but it's a piece of a skull. It gives us more. Compared to the finger and the teeth, it's nice to have." But, he adds, it's hardly a full skeleton. "We're always greedy," he laughs. "We want more." The new discovery consists of two connecting fragments from the back, left-hand side of the parietal bone, which forms the sides and roof of the skull. Together, they measure about 8 cm by 5 cm. DNA analysis proves that the piece is Denisovan, though it's too old to date with radiocarbon techniques. Viola and colleagues have compared the fragments to the remains of modern humans and Neanderthals, according to the conference abstract, although Viola is unwilling to discuss the details of what they learned until the work is published. I'm kind of happy they didn't find enough to make much of a difference in our idea of how Denisovans looked. Until proven otherwise, I'm going to assume that Denisovan women were hot and liked cats.